When you’re new to WordPress and want to start a business, there are a lot of things to consider, like finding a suitable WordPress hosting provider. This is not an easy choice you have to make, as it depends on various facts — a fast and secure host, with site-staging, free migrations, and so on. In today’s article, we’ll take a look at the A2 Hosting services. Did you know that A2 Hosting previous name was “Iniquinet”? Later, in 2003, this company was renamed as A2 Hosting, to be easily recognized by everyone. Where’s the A coming? You’re probably asking. Well, the business is located in Ann Arbor, Michigan – USA so, A is from the Ann Arbor. It is an independent hosting company with four data centers so you can choose the location as Michigan – USA, Arizona – USA, Amsterdam-Europe, or Singapore – Asia. You can choose the server’s location. This is important because the closer your content is to your visitors, the faster your content will be delivered. It improves the site’s loading speed by shortening the physical distance. A2 provides several hosting services, like Shared Hosting, Managed WordPress, Reseller Hosting, VPS hosting, Cloud Hosting, Dedicated Server Hosting. WordPress Hosting or Managed WordPress Hosting? We’re tackling the classical question and try to give you a comprehensive answer. All the A2 Hosting plans use the SwiftServer infrastructure. Based on the chosen server location, SwiftServer is a speed optimized platform where servers use free Solid-State Drives – SSD, CloudFlare Servershield CDN, or LiteSpeed Cache for WordPress. A2 comes with several options for hosting services such as Shared Hosting, Reseller Hosting, VPS hosting, Cloud Hosting, and Dedicated Server Hosting. The pricing ranges from €3.44 to €87.49/month. 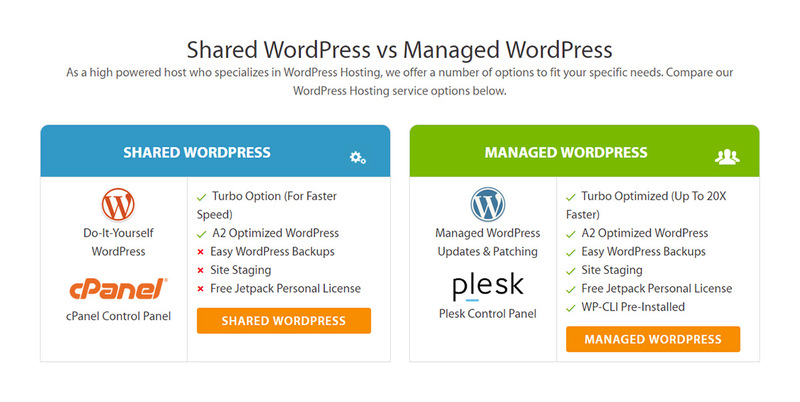 You can choose between a shared or managed WordPress Hosting plan. But now it gets complicated as each of these plans has multiple pricing offers. You should select the one that gives you the best solution to your needs. 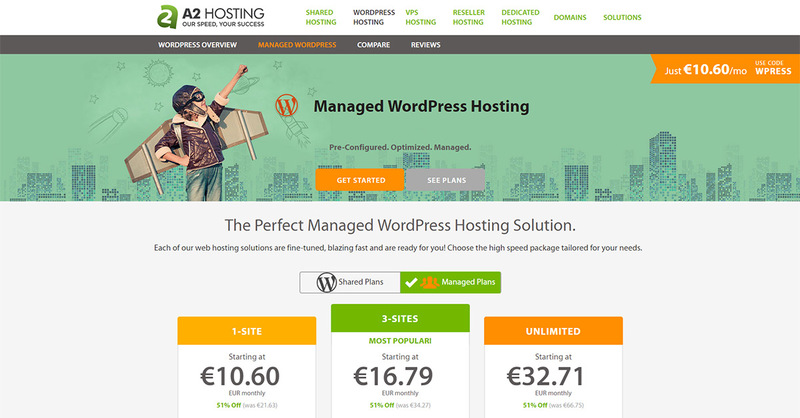 The Shared WordPress Hosting solution comes with three pricing plans. They have a few similarities you might take into consideration while reflecting which one is the best for you. All the three pricing plans give you access to unlimited Raid-10 Storage, Transfer, and Solid State Drive Speed boost within the Complete SSD solution to your files, OS & Database. They also offer a Free SSL certificate via Let’s Encrypt. The Swift and Turbo plans offer an unlimited number of websites, domains, and subdomains. The Turbo package includes some plugins that increase the site’s speed such as WordPress LiteSpeed Cache. The Managed WordPress hosting also comes with three packages for you: 1-website, 3-sites, and an unlimited number of websites. So, is shared or Managed WordPress WordPress hosting service right for you? Shared hosting is for those of you who are ready to go for a lower cost host solution. This could be a choice if your website is new-entry, with not so much traffic. The Shared hosting package comes with the cPanel control panel, and you can see when some of the resources meet the limit (such as CPU and MEM usage). A managed hosting has everything already configured for your WordPress website. It frees you from the maintenance of your sites like the setup, plugins or theme updates. Though it’s a more expensive service, the Managed WordPress hosting has automatic, optimized tools and increased performance. It settles for a low number of sites on the same server and uses a custom designed admin panel, which is better for the user. Also, with this kind of plan you don’t have to worry about updates, caching, HTML, CSS or JS file minification. What’s an A2 Turbo Server? A2 Hosting is well-known for its statement of having a Turbo Server option that allows pages to load everything up to 20x faster. This kind of server uses a speed boost Apache alternative. The users get more resources while fewer users (websites) share the same server. The main benefits are that they can host unlimited websites, sub-domains, add-ons or parked domains, RAID-10 Storage, Server Rewind Backups, and more. These Turbo Servers include more caching solutions than the others and can be customized with the A2 Optimized WP plugin which integrates options with the functionality given by third-party plugins to increase your site’s speed and security. To improve the pages’ performance, the caching solutions store in memory key pieces of the website, instead of loading every page portion each time the site is accessed. This option could be a good choice if your website gets a lot of traffic. 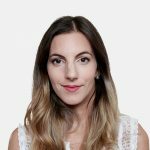 Who Manages the WordPress Setup in A2? By choosing the Managed WordPress Hosting, the A2 team assures they take care of the whole WordPress setup, while your access to the Plesk control panel is granted. Furthermore, as A2 has the WP CLI installed by default, you can manage your WordPress sites using the command-line tool. This means you can update plugins and configure multiple websites installs, without using a web browser. By now, I’m sure you already have a powerful theme in your mind to help you make a great online presence. You can choose from a free theme WordPress repository, or you can take it to another level with a premium theme form a market like ThemeForest. 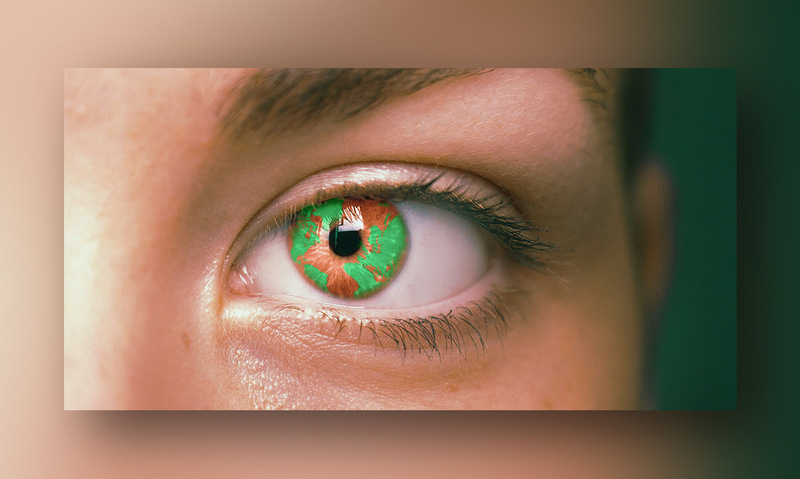 If you’re looking for a news, blog, or magazine oriented template, your choice should be the best-selling Newspaper theme which offers you entirely front-end customization possibilities for posts and pages. With a boxed layout, another popular theme to fit your sport, medical, traveling or tech website might be Newsmag. Featuring some new technologies to speed up your website, the A2 Hosting gives you multiple options you can choose from. If you got much traffic on your site, you should check out the managed hosting services. 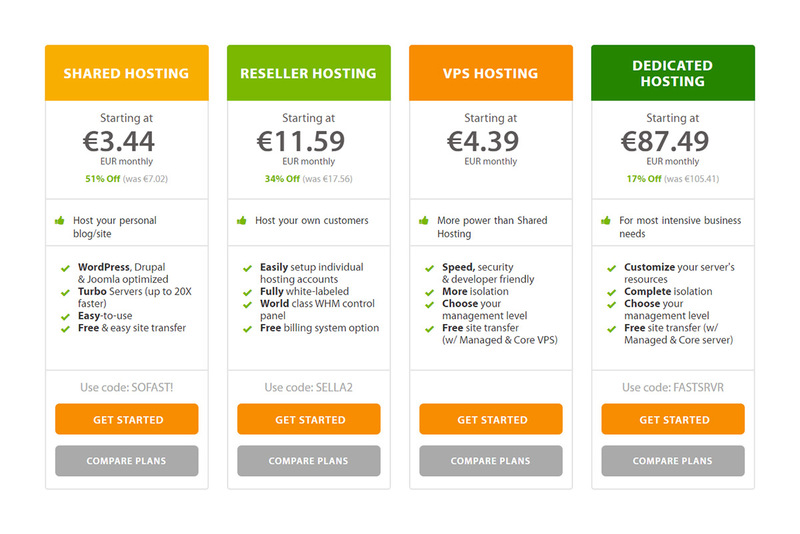 Is this the right hosting service provider for you? Do you have experience with this provider? Share it with us in the comments below and help us improve the web.